I couldn't agree with you more! 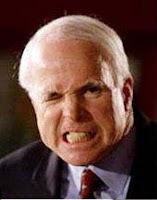 John McCain, once respected for his service to our country and for being something of a "maverick," has become a mean old man and the sorest of losers. He played dirty in his campaign and, thankfully, America spoke, loud and clear, against him, but more importantly FOR our classy, eloquent and fair president, Barack Obama! Justice was served. I love this one! When I see him roll his eyes (again and again) I want to reach through my television and give him a good old fasioned Vietnamese spanking... Is that mean?